The concept of the grilled cheese sandwich is not a recent one. Humans have been combining bread and cheese for centuries. Even the Ancient Romans put together recipes for cheese melted on top of bread. Across America, you'll find creative takes on a grilled cheese sandwich formally created in the early 1900s. The modern American grilled cheese sandwich is a more recent invention. In the early 1900s, a young man named James L. Kraft was pushed out of his partner's business and stranded in Chicago with only $65 to his name. Kraft bought a mule, purchased cheese wholesale, and then sold it to local grocers. He soon realized that the major drawback for his cheese customers was spoilage; most restaurants and store owners did not have refrigerators so cheese wheels had to be used within a day of cutting. In 1915, Kraft invented a way to manufacture a blended, pasteurized cheese that he called "processed cheese." This pasteurized cheese could be transported across the country without spoiling. He patented his invention in 1916 and soon began selling Kraft cheese across the nation. He sold packaged bulk cheese and grated cheese. Early grilled cheese sandwich recipes were made by mixing the grated cheese with a binder, such as salad dressing, white sauce or mustard, and toasting the sandwich between two slices of buttered bread. These were called "Toasted Cheese Sandwiches." During World War I, the United States Army purchased 6 million pounds of Kraft's cheese. In World War II, Navy cooks prepared countless "American cheese filling sandwiches" for hungry seamen. Depression-era families found processed cheese to be a cheap and filling meal. Kraft sold nearly 8 million boxes of its macaroni and cheese during the Depression, under the marketing campaign that you could feed a family of four for 19 cents. School cafeterias purchased cans of tomato soup to go with toasted cheese sandwiches to satisfy the Vitamin C and protein requirements for school lunches, leading to the classic childhood combination. Soon, grilled cheese sandwiches were everywhere. A 1934 Washington Post article explained, "Sunday night is a grilling time... Grilled cheese sandwiches are no new thing. We get them in drug stores for lunch and at tea rooms for supper. But when the housewife begins to grill there is no limit to the combinations she may use and the delicious Sunday night suppers she may serve. Open-face sandwiches of cheese and tomato grilled, offer a combination of flavors sure to please the palate." In 1949, Kraft Foods introduced Kraft Singles, individually wrapped slices of processed cheese, and it became even easier for home cooks to make grilled cheese sandwiches. 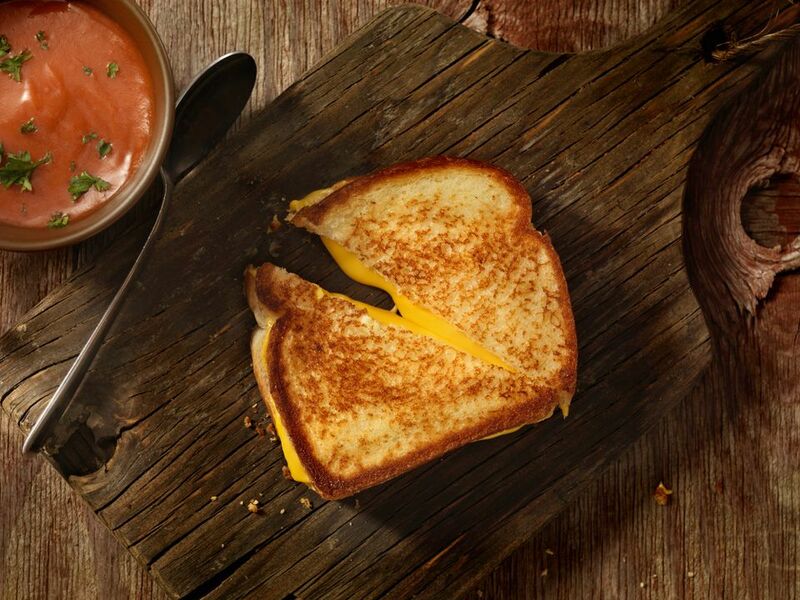 Today, grilled cheese is making a resurgence with gourmet versions popping up in restaurants across the country and people exploring international varieties of grilled cheese sandwiches. In the U.S. cheddar has become the most popular cheese to use in the sandwich. But in Oregon, visitors have discovered grilled cheese heaven. In southern Oregon, Rogue Creamery, famous for blue cheese, puts together such interesting combinations as their house-made mild white cheddar and a mild Rogue blue to create a noteworthy sandwich. They offer recipes for even more creative options, like a Crispy Rosemary TouVelle grilled cheese sandwich. In Portland, Oregon head for the popular Grilled Cheese Grill food truck complex in the hip Alberta Street area. Inviting you to "come by for a taste of your childhood," they have over the top creative versions, too. Very popular is the famous "Cheesus," They replaced the bun with two grilled cheese sandwiches filled with Tillamook cheddar and classic American cheese. The inside of the sandwich contains more traditional condiments and a one-third-pound burger. Food & Wine Magazine compiled a list of the Best Grilled Cheese in the U.S. and includes such cheesy delights as the Crabby Melt from Grilled Cheese & Co in Catonsville, Maryland. The local chain serves up the regional favorite made with local crab and jack cheese on top of homemade "crabby dip." You could easily put together a road trip across the U.S. to taste gourmet grilled cheese offerings, the sandwich born as a simple toasted white bread sandwich with American cheese.